This show was Mom’s favorite of the day, hands down, and I have to agree. Hannah Star and her show Boombox just got into the Fringe off the wait list two days before the festival opened but that fantastic preview she gave at the Touring Artists Showcase really got the word of mouth going fast. She packed the Bryant Lake Bowl for her first show. 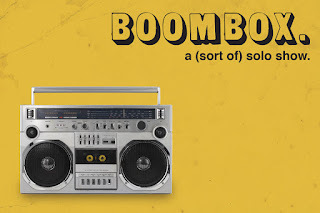 It does my heart good when a great show finds its audience so fast (and this probably means you should reserve tickets or get there early if you want to get a seat - Boombox’s other performances are today, Friday 8/4 at 5:30pm, Sunday 8/6 at 7pm, Thursday 8/10 at 7pm, and Saturday 8/12 at 2:30pm). So what’s all the fuss about? The framework for the show is that the whole thing is tied to a pre-recorded cassette tape played on a boombox which Starr received from her late aunt. Starr knows how to play to the local crowd, though, with a tiny hint of the opening chord to Prince’s “Let’s Go Crazy” before the established tape really gets going. After that knowing musical wink to engage the audience, we follow an individual named (and probably based on the experiences of) Hannah from pre-waking dream state through her day job making sandwiches to an evening working with an improv comedy troupe, and back home again to sleep. There are tangents following people she encounters but it always cycles back to Hannah. However, it’s not a structure you’re fully aware of until it’s almost over, so you never really have a chance to get ahead of it. Starr’s meditation on the human condition, its innate loneliness, and longing for connection is what ultimately makes the show so powerful, and yet it’s presented through such generous helpings of song and comedy that, as sad as it can sometimes be, it also remains hopeful rather than succumbing to cynicism and despair. There’s a recurring riff dealing with the homeless. There’s Pandler, the app for homeless people directing them most efficiently to the places and people where they can get the best handouts. There’s Lorainne, a homeless woman who presents us with several different scenarios she uses for getting money from strangers. Lorainne also bursts into song telling us “It’s Hard To Be Vegan And Homeless” - a musical number that resurfaces for further laughs later when we get its context. Two different offshoots on loneliness entertain in different ways. As a poignant soundtrack emanates from the boombox, a Facebook poster waits in vain for someone, anyone, to Like their latest status update. We revisit the sad poster twice again - and not to spoil anything, but there’s a long grey beard and a skeleton involved as the bit progresses. Then there’s the Lyft driver that slyly turns a basic fare into an impromptu date night, something they miss from days in high school when they used to hang out with friends. Sure, it could be creepy, but the driver’s desire for connection is so genuine, the whole thing seems strangely sweet. The highlight for me was when Starr burst into song from her own interior monologue on the sidelines of an improv comedy game of “Freeze” that just wasn’t giving her the joy it once did. Her longing to actually get life to slow down for a moment, as she was trying to reevaluate her choices and where she truly wanted to be, was breathtaking. Checking the phone before bed, Starr is assaulted, then comforted by the cacophony of voices calling out into the void. One wonders if the isolated poster who never got a response is out there, somewhere in that mess, still waiting. This late addition of Boombox is going to be one of the standouts of the Fringe. If I see a few shows as good or better than this, it’s going to be great year of Fringing indeed.